From its looks, the Lamborghini Terzo Millennio looks like the new muscular hero which will avenge all past jokes on electric vehicles. Terzo Millennio translates to “third millennium”, and from the very first glimpse at the beast, you’ll appreciate Lamborghini’s efforts in setting out an example for other automakers, showing them mean machines could look like in the future. But if you have ever wanted to witness the Terzo Millennio in real life, Gameloft, the developer of the Asphalt series of racing games, is now bringing you the golden opportunity of visiting the Lamborghini HQ in Italy. To grab this opportunity, all you have to do is immerse yourself in Asphalt 9. Lamborghini and Gameloft have announced a contest together inviting mobile gamers to experience the thrill of driving the latest electric Lambo. 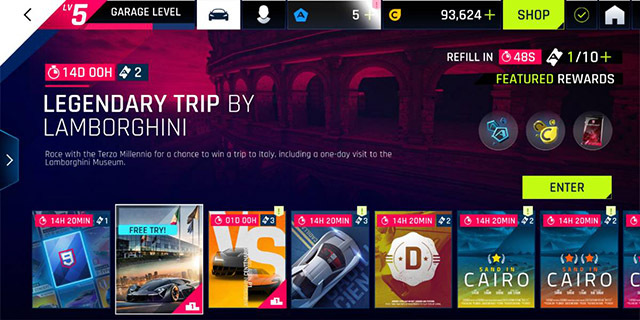 To participate in the contest, you must select the “Lamborghini Trip Cup” from the list of time-limited Asphalt 9 events. You can race as many times as you wish to increase your chances of being at the top of the leaderboard. There will be daily events and objectives which you will have to accomplish in order to win special points and bonuses. The player at the top of the leaderboard will win in-game tokens and currency approximately worth of €850. The winner will also be rewarded with a two-day all-expense-paid trip to Lamborghini headquarters in Italy as a VIP. The second and the third player will not get to go to Italy but will earn rewards worth ~€260 and ~€130, respectively. The in-game rewards extend to the top 5% of the players on the leaderboard and each of them will get prizes worth €38. Gameloft will also reward the remaining Asphalt 9 players in the leaderboard with prizes ranging from €19 to €3.5 depending on the player’s position. The contest is valid till August 19 and as I mentioned earlier, there is no limitation on the number of times you race. To master the new touch drive mode and improve your chances of maintaining a winning streak, take a look at our guide.